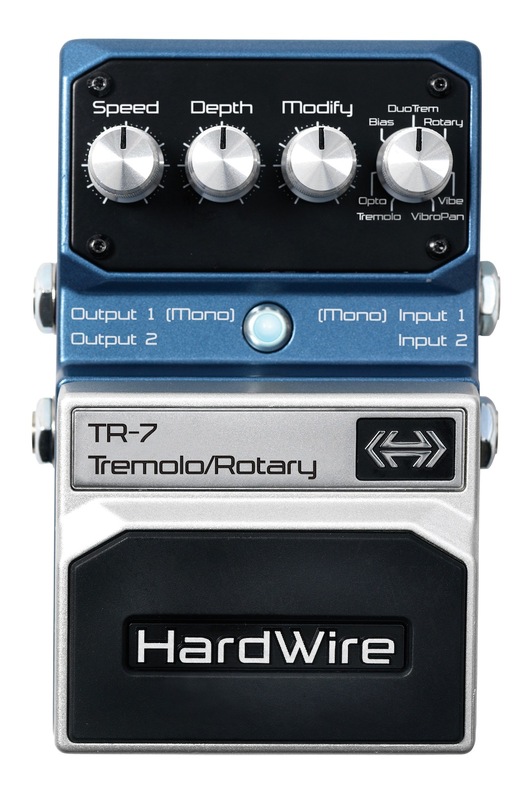 HardWire®, a leading manufacturer of guitar pedals, is introducing the new TR-7 Tremolo/Rotary Pedal at the 2010 Summer NAMM® Show in Nashville, Tennessee. The TR-7 is a true stereo tremolo, rotary, and vibrato pedal, which offers effects ranging from traditional tremolo to a highly detailed rotary cabinet simulator. It also features true stereo I/O, allowing for complex connections and sounds with extreme flexibility. The TR-7 features seven effects including; Tremolo, Opto-Tremolo, Bias Tremolo, Duo Tremolo, Rotary, Vibrato, and VibroPan. The TR-7 also includes HardWire’s standard extreme performance features like true bypass and high-voltage rails. “We improved on an already impressive lineup of HardWire pedals with the introduction of the technologically superior tremolo and rotary pedal. The highly advanced processing in the TR-7 is an exciting addition to a tour-worthy package of the HardWire pedals,” stated Rob Urry, president, Harman Music Group. Each HardWire pedal also features an assortment of tour-worthy accessories, including green gaffer tape common to pro pedalboards, Stomplock™ knob guards to maintain pedal settings and a hook & loop pad to fasten the pedal to a pedalboard. The TR-7 will be available August 2010 with an MSRP of $189.95.